After one of the driest summers on record, the grounds staff is looking forward to the Washington rain coming our way. However, I am sure come February we will be singing a different tune. This season seemed to never want to end and it looks like it may not for a few more weeks. The rain holding off for just a bit longer will be a benefit for our team, and allow us to prepare the golf courses for the winter. 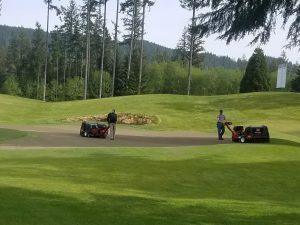 Some of the majoy tasks you will see us working on before the rain finally does come are: aerification of tees, fairways, and approaches, repeating spring aerification on our greens, overseeding distressed areas form the season, and drainage projects. Drainage is key to all golf courses across the nation, however most of them do not see 70+ inches of rain throughout the winter. There are a few areas in need of drainage to improve playability not only in the winter but also in the summer. Over seeding distressed areas sooner rather than later will make a great difference to our courses come spring. If we wait too long into fall and winter, it will be difficult to get the seed to germinate and the seedlings to survive. Giving the plant a chance now will pay off come April. Aerification of tees, fairways, and approaches will help the golf course handle the rains this winter. It should allow the property to drain better over the next few months allowing for better winter conditions. This will also provide a healthier product for the following season. Breaking up the compaction as well as removing organic matter from the profile should have lasting benefits on the golf courses. Lastly, we hope to aerify October 9 and October 10 – weather dependent. We will be repeating the process we had so much success with this spring, as we saw our greens respond better than every. Hopefully by doing it this way, we will have a high-quality product during the winter that can also handle the feet of rain we anticipate. So, before the rain does finally start pouring, we hop to get the course in the best shape possible to handle the Pacific Northwest fall. Summer time is here and the entire team is on deck and ready to make Gold Mountain the best course for our golfers. As a mechanic, this means I need to get the equipment ready for the intense labor done throughout the season. 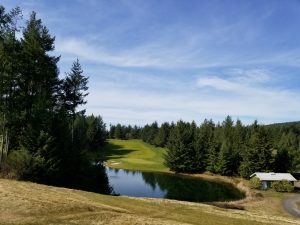 I need to make sure the welder is dialed in, spare parts are on the shelf, and so much more that goes into making Gold Mountain Golf Club the amazing facility that it is. A lot of prep work goes into ordering parts and being ready for the call to come fix equipment at a moment’s notice. During the summer month my assistant and I focus on keeping the reels sharp and cutting well on all machinery. Of course, it’s not always that easy seeing this is not the only thing we have to focus on. With a full staff running around our 36-hole facility, we have our phones on and tools ready for the “I’m stuck” calls or the “My mower just stopped running” cries. We have a lot of equipment that has been around for more than 20 years, and keeping it going is a task in-and-of itself. There is always something happening to keep us busy, not to mention a golf course full of golfers. 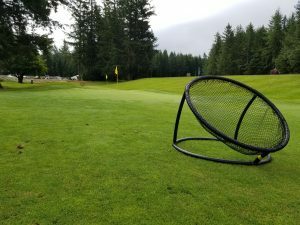 Maintaining our equipment properly is a requirement to make sure we are not wasting precious time fixing something that could have been avoided, or leaving a team member stranded out on the course. 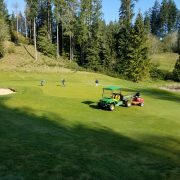 Regular services and making sure our team members inform us of any funny sounds can save us the embarrassment of that ugly turf repair or hydraulic burn on the course. Don’t be fooled however, this is the reason we love our jobs as mechanics! There is always something new, challenging, and unexpected happening here at Gold Mountain Golf Club. 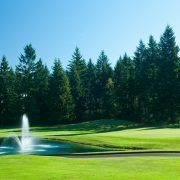 Not many golfers know what goes into making their favorite course so amazing, and we are so proud of the product we are able to produce every day here in Bremerton, Washington. You’ve heard the phrase a million times. 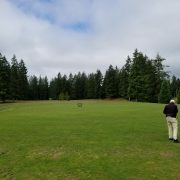 Gold Mountain Golf Club is known for having two of the best public golf courses in the state of Washington, but did you know we also have an amazing practice facility? The addition of range targets is very exciting and give golfers a new focus while practicing. In the lower, short game bowl the range targets will help golfers dial in their short wedge distances more effectively. The best part is, now you can bring your friends out and have some friendly competition on the range! Our practice facility also has a multitude of chipping and putting greens that will allow golfers to further practice their short game. With new mowing patterns around our short game facilities golfers are able to work on tight lies, various distances, and more to get them ready for the golf course. Perhaps you’re having trouble hitting your wedges. Getting your ball on line with the putter. Finding the fairway with your driver. Gold Mountain Golf Club has a variety of group clinics and golf instructors available to help you improve your game. Learn more about group and private lessons online, and find the instructor that fits your style and budget best. Let our golf instructors improve your game and allow you to have more fun on the course! 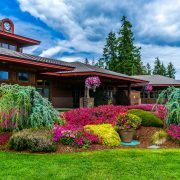 https://goldmountaingolf.com/wp-content/uploads/2018/06/20180625_090241.jpg 3024 4032 teesnapdev https://goldmountaingolf.com/wp-content/uploads/2017/04/goldmt-logo_2Color_transparent-1-e1493064764505.png teesnapdev2018-06-26 16:29:302018-06-26 16:29:52Practice, Get Better, Have Fun! I just picked up the book And The Putter Went…PING by Jeffery Ellis and it is heavy…literally. The book tells the true American success story that began in the garage of Karsten Solheim, as he invented the PING putter in 1959. Why is there so much to be said and chronicled in huge color photos and print about PING? I recently spoke to the Pacific Northwest PING Sales Manager, George Houlihan, about what makes PING different from other club companies and he said it comes down to principles and design. “It all boils down to engineering principles and design. PING is a family run company, who is now in its third generation of engineers. They never put a product in to the market place unless it is better than its predecessor. All that engineering and design is to the benefit of you and I, making a more enjoyable, forgiving, and better performing product. That’s why the Gold Mountain Operations Manager, John Sitton, is on staff with PING. “I love their putters and irons, specifically their player irons. Right now I’m playing the iblade, five through pitching wedge, and the i200, three and four irons. My putter is the Sigma G, Tyne. It is the color coding system that was invented by PING in 1972, that distinguishes the lie angle of the club, and is recognizable and memorable by the golfer who plays PING. John Sitton identifies with the old color charts yellow, which translates into the green on the current color chart. So even with the new color chart out, it is still easy to remember his lie angle. Scott Alexander’s PING clubs fit in the Maroon color code. Scott, who was the Director of Golf at Gold Mountain Golf Club for 27 years, has been playing PING clubs for about 25 years. He was also PING’s 2007 fitter of the year! “What stood out to me about PING back when I started selling them was that they were the original “fitters” of the golf club. Fit is important to me because I am 6’5″ tall and need a five degree upright club. So, I’ve learned a lot about PING in my brief exploration of its history, club design, engineering, and their effect on the players who play them. Nearly everyone I spoke to said that people who have bought PING, become PING customers for life. That is the exact reason why Gold Mountain Golf Club continues to bring our guests the best selection of PING clubs. We have over 30 PING demo options to try and over 75 clubs in stock to sell today, not to mention professional fitting is available and custom ordering is quick. Do you know your PING color code? Come see us today to find out! https://goldmountaingolf.com/wp-content/uploads/2018/06/g400lst_driver_1440x700_style1.jpg 700 1440 teesnapdev https://goldmountaingolf.com/wp-content/uploads/2017/04/goldmt-logo_2Color_transparent-1-e1493064764505.png teesnapdev2018-06-07 11:18:362018-06-07 11:19:15"And The Putter Went...PING"
We all know that aerification is a sensitive subject for golfers but, I feel with the proper information and education there can be a better understanding of why we do it and how it benefits the playing experience throughout the season. This year, we tried something different at Gold Mountain. 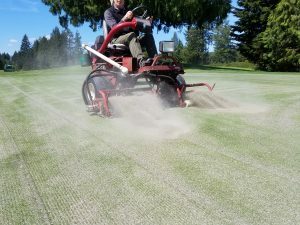 In the past, we would punch a few small holes and then topdress the greens with a light layer of sand about a week later. This season the whole process changed and we have seen great results. We started with a heavy layer of sand, about as much as we typically use in the fall. Followed then by punch the greens with 60 3/8″ solid tines, which is twice as many tines as normal. After the punch, we waited for the sand to dry, which is a lot like watching paint dry. It is essential to make sure the sand is completely dry, otherwise when we drag the greens the sand will seal off the holes and we won’t get sand into the profile. Now is when the race begins. First, we send a steel drag mat out to do an initial once over drag. After that, we send our verticutting units set at 1/8″ to help work the sand into the profile. 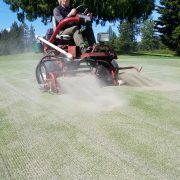 Next, the brush drag mats make two or three laps around each green, which helps move even more sand into the profile. Lastly, we take our heavy greens roller over them to smooth out any lumps or imperfections. After this process is done the greens are ready for play. They are not in mid-season form directly following this process, however they are in great shape considering everything we put them through over the day. One day removed from aerification, I would say our greens are at least at 85% and should be back to 100% roughly seven to 10 days following. This process is very important to producing the best possible playing conditions throughout the season. It will allow us to provide fast, firm, fair, and true greens because it allows for gas exchange and water movement within our greens. So, when you look back at the week following aerification when you are playing in July and the greens are perfect, remember to say thanks for punching them in May! Travis Cary here, Assistant PGA Golf Professional at Gold Mountain Golf Club. One of my primary responsibilities as Assistant Golf Professional is to teach and grow the game of golf. The sun is starting to come out and summer time is right around the corner, which means Gold Mountain Junior Camps will be underway in the next few months. There have never been more junior golf opportunities available at Gold Mountain, which makes it the perfect time to get your junior golfer started in golf. 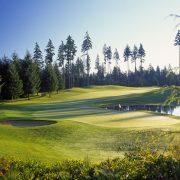 PGA Junior League is an exciting program that we now have available at Gold Mountain beginning May 1 and will run through the month of June. These juniors will get hands-on instruction from myself, and also get a fun and relaxing introduction to competitive golf. The best part is, PGA Junior League is perfect for all skill levels! The kids will receive numbered jerseys and other gear, all included in their entry fee. In addition to PGA Junior League we will be hosting our annual Junior Camp in summer 2018! 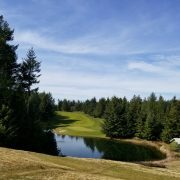 The camp will be held at Gold Mountain Monday, July 9 through Friday, July 13, from 8am to 12pm Monday through Thursday and tee times beginning at 5pm on Friday, our Cascade Course, to allow the kids to take their new skills on the course. 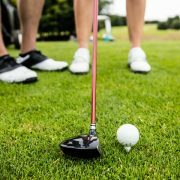 This camp is open to juniors ages six to 17, we have equipment available for your junior to use while in camp if necessary, and we want to welcome every level of golfer. 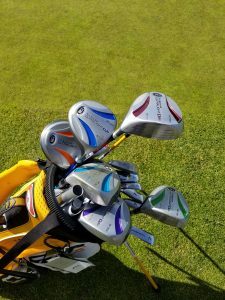 If you are interested in getting your junior golfer a set of clubs to take on the season US Kids Golf is a great company that designs clubs made specifically for kids. Beginning in 2018, I am offering free club fittings for any junior looking for a new set of clubs at Gold Mountain. Visit US Kids Golf to view all of their great products and contact me via email to set up an appointment. 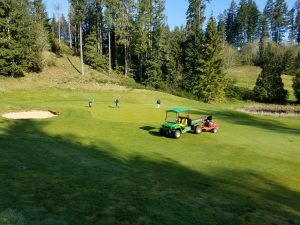 As we recover from a late winter wind and snow event, it is hard to believe that this year is off to a tremendous start when you consider that last year brought with it some of the worst possible weather for Northwest golfers. It is true, a misty, mid-40’s February day doesn’t spark the intensity to hit the links and fire up the old golf game. But for those that do venture out of their heated abodes, open tee times and fantastic playing conditions await on both of our golf courses, just don’t wait too long. We are only three and a half weeks away from our first major tournament of the season, Mountain Madness, the two-day, two-player, scramble and best ball Event scheduled for March 17 and 18. If you are interested in participating, you can register online. 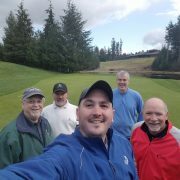 Gold Mountain’s yearly spring tournament is our unofficial start of our golf season. It marks a time when our team members begin to welcome back our afternoon leagues, prepare for our annual Demo Day event, open up or facility to our local high schools as their seasons ramp up, and of course start our preparation for the 2018 Mountain West Conference Championship. Gold Mountain has the honor of hosting this Division I college tournament April 19 through April 22, as the best players in the Mountain West test their skills for the top spot in their conference and attempt to qualify for the NCAA National Championship. If you are interested in volunteering for this tournament, please contact the Golf Shop at 360.415.5432 for more details. After every national tournament we host, one of the first things that we receive praise for is the amazing and dedicated army of volunteers that we produce. We would love to have you on our team for the Mountain West Conference Championship! Before I end my ramblings, please allow me to give my sincerest thank you to our recently retired Superintendent, Ed Faulk. I’d like to think that I am pretty good at my job, but let’s be honest, you don’t come to play golf at Gold Mountain to see me. 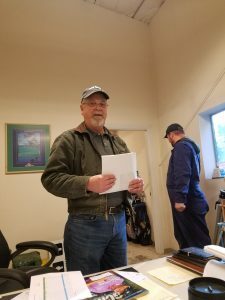 You come to Gold Mountain because it is a facility that is always in great shape whether it has been an exceptionally wet and soggy season, or on those rare years where it never rains and we are near drought conditions. 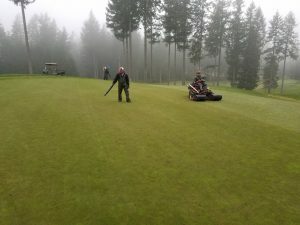 Ed worked tirelessly for 34 years at Gold Mountain Golf Club, never questioning a crazy idea about tee times from me or complaining about a freak windstorm that brought down hundreds of trees (both have occurred). Ed took exceptional pride in Gold Mountain and there are many of us here who are thankful for the opportunity to thrive in our careers because of the stability he created with both of our fantastic golf courses. Thank you, Ed, we will all miss you! If you’re like me, you get excited about January because it is a time to clean out the old clutter, old thinking, and old bad habits to make room for new ideals, goals, and even products that will help you achieve them. Maybe you’ve put away your golf clubs for a couple of months, but are now packing them up to head on vacation or are moving them around as you sort through the garage. Either way, there are probably some old clubs, bags, carts, or shoes that you’ve still got hanging around from the past few years (or even decades)! Wouldn’t it feel great to pass those on to someone or finally just give them one final “thanks for a great run,” and on to the new? If you have golf gear in excellent condition that you’d like to donate to a junior program or give to a person who may not be able to afford them brand new, now is the time to donate. Gold Mountain is a great place to donate your used gear and know that you are helping a new golfer experience the game of golf. Make sure to join our e-club to stay up to date on when and where you can donate your used equipment and what perks we have for you. Out with the old and stop in the Golf Shop for some of that new in 2018! Normally this time of year, I would talk about winter projects we are working on and what we are preparing and planning for the upcoming season. Instead, we will look at the great 34-year career Ed Faulk, Superintendent, has had here at Gold Mountain Golf Club as he prepares for retirement in January 2018. Ed was hired in March 1984, long before the Olympic Course was built. 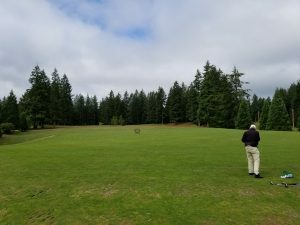 He spent 13 years as the Assistant Superintendent on the Cascade Course and took over as the Superintendent of the property when the Olympic Course opened in 1996. He will have held that title for nearly 22 years when he retires at the end of January 2018. It is a testament to Ed’s knowledge, commitment, passion, and ability to have retained his title and position for such an extended period. There are a number of highlights Ed has spoken of when reflecting on his career here at Gold Mountain, but there are a few that stand out more than others. First, was the opportunity he was given to be the Superintendent. When the position became available in 1996, the decision came down to two candidates; Ed and a well-established superintendent from within the gold community. When Ed was awarded the position, he knew he would not let the City of Bremerton down and would work hard to always prove they made the right choice. Second, Ed has reflected on what a special moment it was for him to open a championship golf course in the Olympic Course back in 1996. Ed has hosted many national tournaments including NCAA regional qualifier and University of Washington Husky Invitationals, but the two that meant the most to Ed were the 2006 U.S. 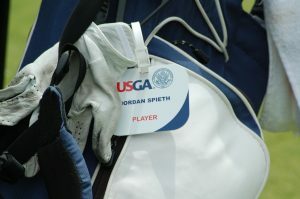 Amateur Pub Links Championship and the 2011 U.S. Junior Amateur Championship. Ed has had a big impact on more than just the property at Gold Mountain Golf Club. He has had a great impact on the people that he not only worked with but also the guests that visit his golf courses. Ed is on a first name basis with so many of our regular guests and always takes the time to ask them about how they are doing, and he takes a personal interest in their lives. Ed is also highly respected by all fellow Gold Mountain team members. Daryl Matheny, General Manager, spoke recently about Ed and what he has meant personally and professionally to the club. Daryl said some of the things he will miss when Ed retires are his work ethic, he is a jack of all trades, the way he always stepped up to make sure whatever needed to get done was accomplished, but most importantly the ownership Ed took in his work. Daryl always felt Ed put out the best possible product and made sure whatever he was assigned was handled in a professional and meticulous manner. Daryl also shared that his favorite memory at Gold Mountain with Ed was preparing for, and hosting, the 2006 Amateur Pub Links Championship. Daryl said Ed had the course in perfect condition and the USGA was extremely pleased with the way the tournament went. For me personally, Ed will be greatly missed. He has been an incredible mentor in developing my skills and preparing me to take the next step in my career. I will be forever grateful to Ed for giving me an opportunity to be his assistant. He had done a great job of sharing his knowledge and experiences with me while allowing me the freedom to figure everything out my own way. Ed has helped guide me in the right direction, but from a distance, which has allowed me to learn from my own experiences. Gold Mountain Golf Club, as well as all the people who have worked with Ed, will truly miss him. We wish him all the best as he enters this next chapter of his life.